If you go down to BeWILDerwood today you're sure of a big surprise - with a Scaaaaary Lake, Mildred the Crocklebog and a tiny Twiggle Village to feast your eyes upon! There is plenty of outdoor play equipment, picnic space and even a maze that the whole family can enjoy at this enchanted treehouse adventure. We recently travelled to Norfolk and received tickets to BeWILDerwood for a fun packed day of climbing, jumping, swinging and running. Here you board a small boat that takes you on a journey across the Scary Lake to the centre of the wood; where your adventure really begins. Along the way you can hear about (and see) the Crocklebog Mildred and learn about the Boggles and Twiggles. This short ride really sets the scene if you haven't already read the books by Tom Blofeld that BeWILDerwood magic is based upon. 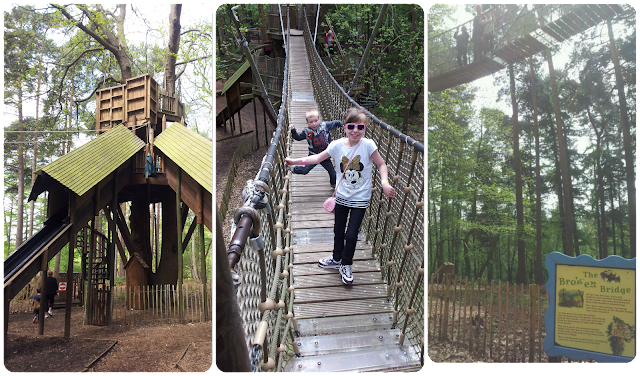 The first stop for us was the Broken Bridge where you head high into the trees to climb across the transparent planks! 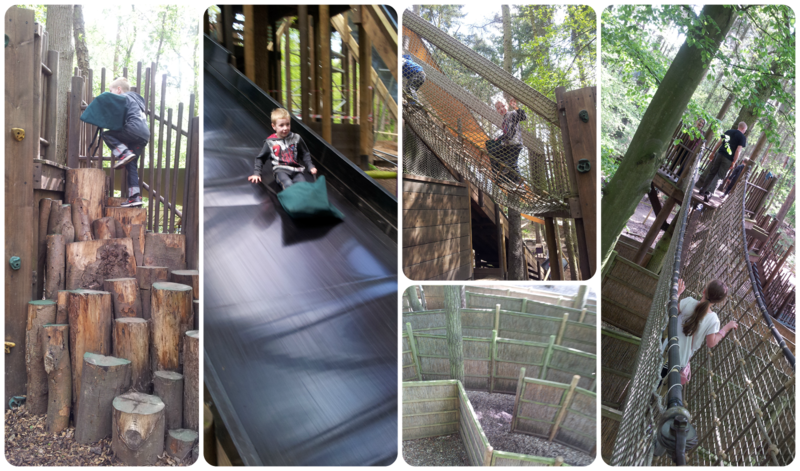 There are lots of steps, a cargo net and slides to experience and back down on the ground there are swings and logs to balance on too. With several ways to get up the top of the slides even the climb itself is fun! There are different sized logs to clamber up, a wall with grips, a slope with a rope and a cargo net up to the two slides, one of which is split into three lanes. There are mats available for a super slippery ride and other apparatus nearby to keep you entertained. We raced, girls vs boys, to the centre of the maze where there is then the look-out and bridge to conquer. The maze itself is made from panels around 6ft high and you can look out across it from above to help others through (or look for the lost!). There are plenty of staff to ensure the zip wires run smoothly and even baby and toddler editions too! They vary in length and height and queueing time minimal as they are spread out well across the wood, again with fun climbing obstacles to reach them and a soft floor below for a safe landing. These little extras give the magical touch of BeWILDerwood. The tiny homes in the branches and the spare shoes hanging from the tree of the Thornyclod Spider are great to find and lovely discussion points for the whole family. 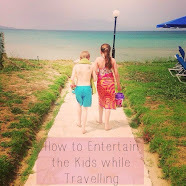 There are several areas aimed at the younger generation in particular which are perfect for toddlers that wish to explore without the height of the trees. Toddlewood on the Hill and Toddlewood Valley have lower climbing frames and slides and is more suited to preschoolers. BeWILDerwood is a great location for outdoor play and as there are shelters and the trees above, it's virtually an all weather attraction. There was slightly less there than I had expected but still plenty to remain entertained for several hours, if not a full day for the very energetic, and I was pleased that adults can go on absolutely everything! If you want to rest for a while or try something different there is face painting, den building and storytelling too so there is a lot of variety. For those with prams or in wheelchairs there is a pathed area to get across the lake to the centre of Bewilderwood as an alternative to the boat. All of the toilets have disabled and baby changing areas and there is even a special area for breastfeeding which I thought was a great idea! Munch bar has a mixture of hot and cold food available and is reasonably priced. The Mini Mes had Swampy's Much Boxes which contained a roll, crisps, mini muffin, yogurt, fruit and a drink and cost less than £5. There is a ice cream stall with some really delicious flavours to try too. You can book a birthday party at Bewilderwood and there are reserved pods for your guests. There is a fantastic gift shop at the entrance/exit which has pocket money items as well as more luxurious products available to purchase. We really enjoyed our visit and we would return. For your chance to win a family pass to BeWILDerwood you can enter via the Rafflecopter entry form below. The giveaway closes on 29th June 2013. I would most like to see Toddlewood as it would be ideal for my 2yr old monkey! What a fun and magical place to visit, it certainly looks like there is so much to keep the children occupied and entertained. The little houses are very cute as are the hanging shoes, they have definitely put a lot of thought into planning such a great place. Thanks for coming over and sharing with Country Kids. This would be a bit of a dare for me as i am scared of heights! My little girl has been on a visit with the school but I have never been. She loves the Boggles!!! I would like to go so I can see what she is talking about and enjoy it with her. 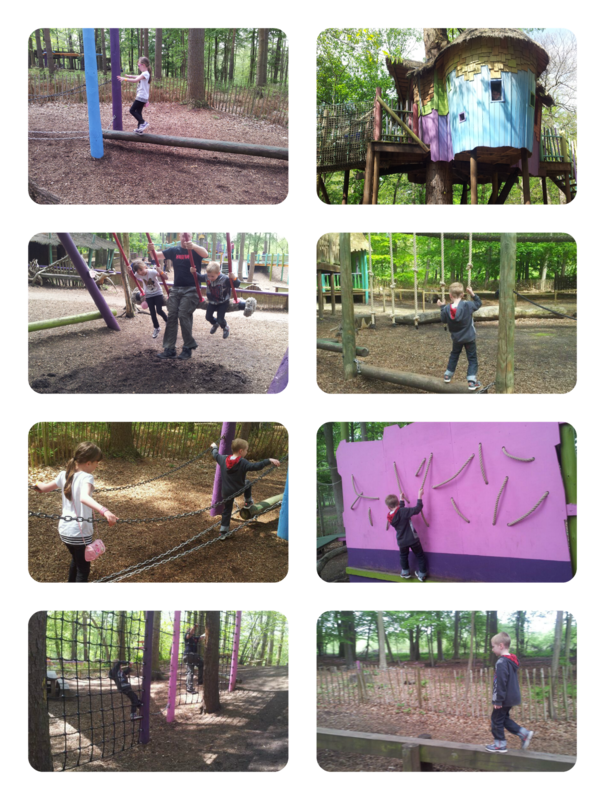 We live quite near Bewilderwood and my daughters absolutely love it. They especially like trying to spot if anybody is in the little houses and seeing the tiny washing hanging on the lines! I have commented on Lunchbox Love. I'd love to see my little run around and tire himself out. our 2 most favourite things at bewilderwood are the boat ride to mildred (of course) with her unexpected bursts out of the water ;) and the big slide where you can all go down at once and race! 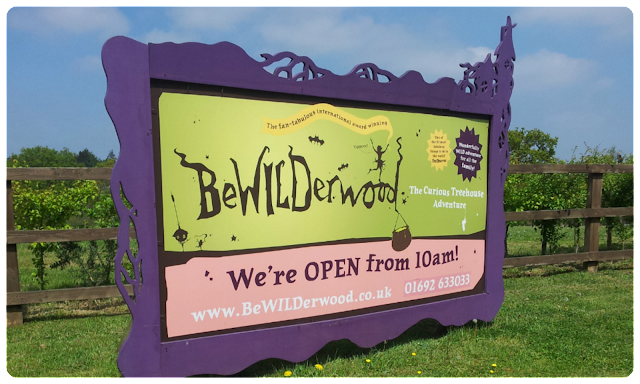 we are local to bewilderwood so have been a couple of times before, even in a thunder storm lol tickets would be a great help as it does cost quite alot to get in though!! I've looked at going here a few times but haven't actually been yet! I'd like to see my girls running about and playing houses in all those treehouses. 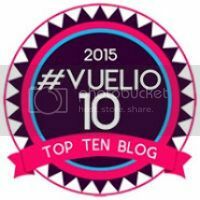 Hi, I'm following you by Bloglovin as Stephanie Tsang, Networked Blogs as Stephanie Cheung-Tsang, and by email. I'd like to take my little girl to see Toddlewood Valley. 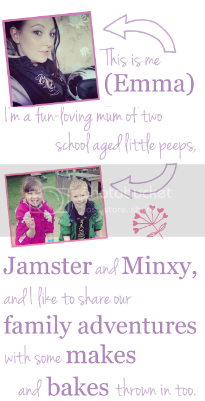 Toddlerwood would be ideal for my two boys! toddlewood would be brilliant for my little ones. i really want to go to bewilderwood! i have heard about it before and thought it sounds good, but after hearing the full info i really wanna go! i'd love to watch my one year old in toddlewood! i've commented on silent sunday. I love the fact its all in the book and you can actually visit the real life places mentioned. Must be even better for a child! This looks great. My kids would love it there. My boys have enough energy to run round there all week!! My 2 girls would love this place. The thing I'd enjoy most - having 2 exhausted girls! Pamela says - I'd love to see my husband on the zipwire! I really like the look of the bridges. The wooden bridges look great, but frightening! My family love it, it is somemuch fun. Like an ewok village! My eldest son has been with school so I'd like to go with all of them and see the tree houses and take part in the den building. My Little Girl Hallie-Anne would most defo love ToddleWood!! We went Bewilderwood a couple of years ago and had a great time - lots to do for children of all ages - including the middle-aged ones.